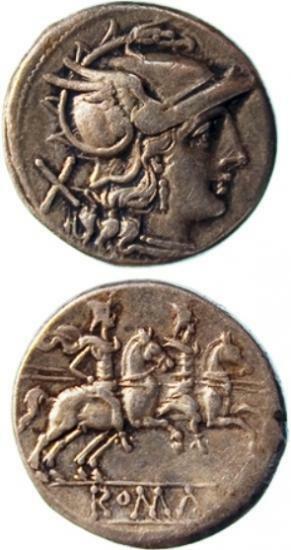 Researchers in classics and medical physics and applied radiation sciences have teamed up to analyze the metallic content of ancient coins in an effort to better understand Greek and Roman trade patterns and the development of modern society. patterns and the development of modern society. Spencer Pope, an archeologist who specializes in ancient Greece and assistant professor of classics, has teamed up with researchers in medical physics and applied radiation sciences to study the metallurgical content of Greek and Roman coins. By finding out what the coins are made of, says Pope, the researchers are able to reconstruct ancient trade routes, understand the development of economies and even determine the extent of counterfeiting. The work will also shine light on modern societies. "The ancient world is a laboratory for understanding the societies of today," said Pope. "This research will help us link the archeological to the historical to understand how we, as a society, got to where we are today." Twenty coins have already been analyzed using techniques including x-ray fluorescence systems at McMaster and a proton microprobe at the University of Guelph. After they are analyzed, radiation scientists are able to tell Pope what sorts of metal are present in the coins, allowing him to determine where they were minted and how widely they may have been circulated. He is also able to zero in on ancient economic downturns - during such times, coins were made with less valuable metals - and even track the collapse of the Roman Empire. "What technique you use depends on what metals you're looking for," said Michael Farquharson, chair of the Department of Medical Physics and Applied Radiation Sciences. "So we use multiple systems to look for a number of metals - gold, copper, silver - present in the outer layer of the coins, then we use the McMaster Nuclear Reactor to penetrate deeper into the coin to determine whether or not the coin was plated with a different material than it was actually made of." The systems used to analyze the coins have a number of other uses, including searching packages for explosive content and analyzing human tissue for the trace amounts of metal found in cancerous tumours, among other things. The cross-campus collaboration between researchers in humanities and sciences is, according to Pope, one of the most interesting aspects of the project. "By working together we can answer questions we wouldn't ordinarily be able to approach," he said. "It's a very exciting example of the sort of work a university can produce."